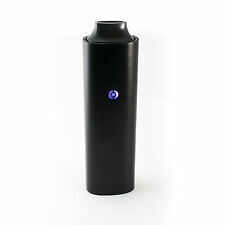 The Tourist Vaporizer works for both Dry Herb and Wax with the touch of a button! Unique water bubbler for each mode. Load your desired amount of wax onto the applicator, switch the unit to “Wax” mode and set your temperature. Sleek and simple, the Vital is perfect for new and veteran users alike. Maintenance is simple and easy, with micro-USB charging, easy dismantling for detailed cleanings, and streamlined operations. Size: h 6.1in, d 4.95in.